George Joseph Melochick was born on 6 May 1915 in St Clair, Pennsylvania. Captain George J. Melochick received two Silver Stars, a Bronze Star, and two Purple Hearts while serving with the 134th Inf Regiment, 35th Division, during its European Campaign in WW II. He entered service as an enlisted man in 1936, eventually becoming Executive Officer of Company B, 134th Infantry. He became commander of Company C, 134th Infantry Regiment, when all other officers were wounded or killed. Wounded twice in combat, the Silver Stars were awarded for heroic combat leadership in Belgium and at Hilforth, Germany. Captain Melochick, assigned to lead an attack in Belgium, moved his unit forward through wooded, fog-bound and snow-blanketed terrain. Suddenly, well-camouflaged enemy tanks, supported by infantry, and by machine gun and artillery fire, struck at Captain Melochick's command with lethal effect. Because of the nature of the terrain, his armor support had been left behind. Captain Melochick countered the enemy blow by moving among his men, shouting orders and encouragement, thereby keeping control and promoting effective fire power. His resourcefulness, courage and dynamic leadership so inspired his men, that their concentrated fire forced the enemy infantry to withdraw, followed by their then unsupported armor. Captain George Melochick was serving with the 35th Infantry Division, in action in the vicinity of Hilforth, Germany, on 25 February 1945. When the assault platoon of Company B, 134th Infantry Regiment, ran into a heavily mined section, and was subjected to concentrated mortar fire during the course of the attack, Captain Melochick, Commanding Company B, immediately went forward and assumed command of the platoon, whose leader had become a casualty. Upon learning that the radio operator had been wounded, and his radio destroyed, Captain Melochick personally secured another radio rather than ask one of his men to traverse the mined area. Upon his return he rallied the troops who had become disorganized, and led them forward. He was rendered unconscious by the near burst of a mortar shell, but, upon regaining consciousness, refused evacuation and led his troops on to their objective. He continued service in the Army after WW II, serving in Greece during the Communist Uprising, and then in the Korean War, where he was awarded the Air Medal and the Korean Service Medal with four stars. 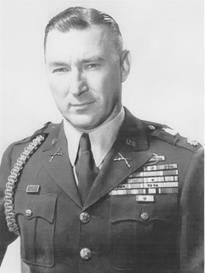 LTC George Melochick retired in 1957 and died in 1997.